Place the numbers from 1 - 5 once in each row and column. In addition there are some inequalities in the grid: these are the > and < signs which are greater than and less than respectively. These symbols appear between adjacent cells, and what they tell you is that the value in one cell is greater than or less than the marked adjacent cell. Thus A > B means that A is greater than B, so if A is 2, B can only be 1, and so on. The addition of the inequalities make for an absorbing rule and adds an interesting logical solving twist above and beyond those used in sudoku. Chains of inequalities can be used to gradually whittle down values. 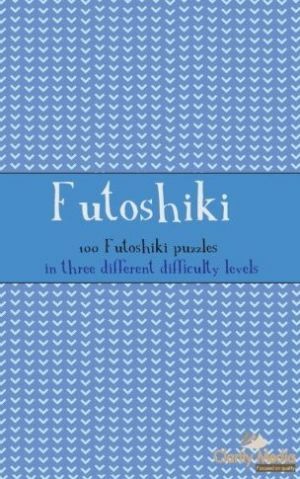 This book of Futoshiki contains a mix of easy, medium and hard puzzles, and the solutions are all there at the back of the book too. Each puzzle has one solution that can be reached by logical rules alone; the hard puzzles will require you to look at sets of numbers in many instances so you'll need to pencilmark thoroughly with those puzzles. The easy puzzles are more of a gentle introduction to get you ready for them, with the medium puzzles somewhere inbetween the two. The main solving tip is to use the inequality signs to extract as much information as you can whilst solving the puzzle. Sometimes these give away more information than you might think, for instance. Take a look at column 2 of futoshiki 1 shown to the right. You will see that the third cell in that column is greater in value than the cell above it and the cell below it: that is, two in the same region. Now, many people when solving here will place the numbers 1-4 in the second and fourth cell of the column, and place 2-5 in the third cell that is greater than these other two. However a little thought reveals that actually the value of that third cell can only be 3-5 here, since the value in this square must be greater in value than TWO other cells in this region, whose lowest possible numbers are 1 and 2 meaning that, whatever happens, this cell must have a value of at least 3. There are some other little things like this that will become apparent to you as you go through solving futoshiki. Of course, in addition to these inequality rules you will also need to use standard sudoku type solving rules. Sometimes you might need to look at sets of numbers too. For instance if you have 12345, 12345, 34, 35, 345 as options for the five cells in a region, then actually you know that the first two squares must contain the 1 and the 2, so the 3,4,5 can be removed as options from them. Can you see why this must be the case? When solving our puzzles you can be reassured that there is one answer to each puzzle and that it can be reached using nothing more than logical rules: you never need to guess, so if you can't work out how to solve the puzzle do persist as it does mean that there is a logical rule you can apply somewhere that you haven't noticed. Good luck and we hope you enjoy these puzzles. 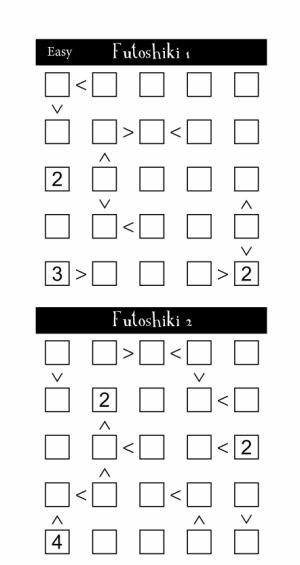 We suggest starting off with the 5x5 for those new to the puzzle, before moving onto the larger and relatively harder puzzles that are offered by the challenge of the 6x6 and 7x7 futoshiki puzzle books.